There are a few things I don’t do, apart from dabbling in illegal pharmaceuticals – I only need two sulfadine to set me skipping, and one of the things I also don’t do is watch tv. Yet here I am on the sofa in Edinburgh, not just watching tv – nope I am watching the BBC IPlayer on digital tv. Ha! It is amazing. The best part is the sofa commentary on the programs. I have learned that my sister’s flatmate doesn’t like Reese Witherspoon. Now, Reese is my girl-crush so we nearly had words. Luckily my sister is sitting in the middle of the sofa. I like Reese, I loved Walk The Line – it is the first film I went to see twice in the cinema. (Before I had the unlimited cinema card, so I actually paid London prices. Twice.) After the second time I saw it, I got mugged. I lived in Harlesden. Reese *sigh* she is great and she does charity. It is remarked that the Keira Knightley also represented the don’t beat your partner cause. I don’t care if Reese is repeating the message that has been told for years and years. The don’t drink and drive message is milked too, so should the abused housewife case. Abuse is bad. Boo. Sophia Loren cancelled so Jonathan is stretching it a bit. This week we have David ex Nirvana drummer and his superstar scrambled together band – the dude from Led Zeppelin is in it too. Next week N-Dubz. Ahh the fickle world of tv. Haha the critics on the sofa deem Dave a little too slow on the drums! Guess he is getting on as well…Question is did Dave play anything else than just drums, could he be an alternative Phil Collins? We wikipedia it, yes the couch critics have Mac books at the ready: he is a multi instrumentalist – it’s ok.
We flick back to normal tv. Oh no! Man City has beaten Chelsea. My sister sighs. I’m surprised, I never thought she cared. She doesn’t apparently and scrolls back through the program list. Friends is on. Friends is always on, somewhere I’m sure, for the next century at least. Then: Sharpe! Sharpe is on! 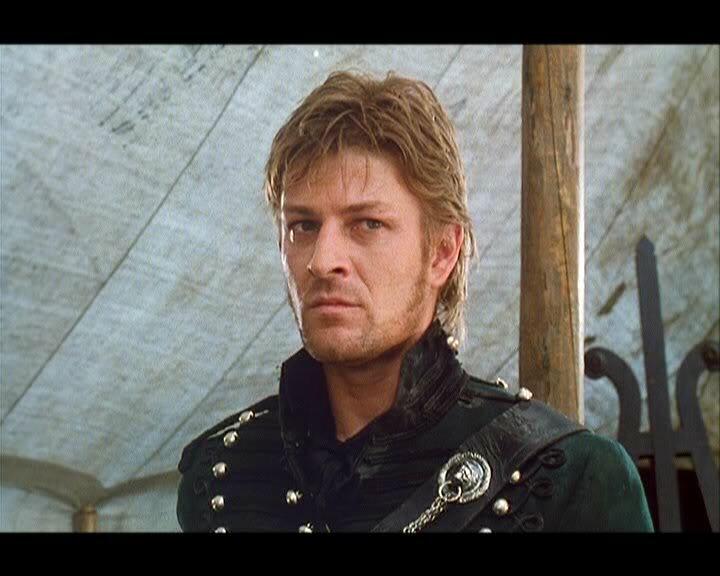 SEAN BEAN! HOORAY! We are watching a wager ( This man could shoot a pimple of your nose without breaking the skin. Couch critics: Did he just say pittbull?) My sister and I love Sean Bean (and I am sure my mum does too.) Sharpe used to be our rainy sundays. Three of us sitting on the sofa for hours… I suddenly remember now: tonight it is a bit similar to what it used to be, be it a few years later and few hundred miles from our childhood home. 15 Bad Ideas that seemed Good at the time.